A couple days ago, The Hairpin posted an interview I did with Mary Timony. It was a super-fun gig for me; Mary talked about being obsessed with Casey Kasem in sixth grade and going to see Rites of Spring and Culture Club and pouring paint in her hair and teaching girls to play "Dig a Pony" on guitar. The part about being obsessed with one of her English teachers in high school is maybe my favorite moment, and all in all it was a very giggly and wonderful phone convo. And if you want to come over and listen to the MP3 of the interview I'll totally let you, for a cover charge of eight million dollars. 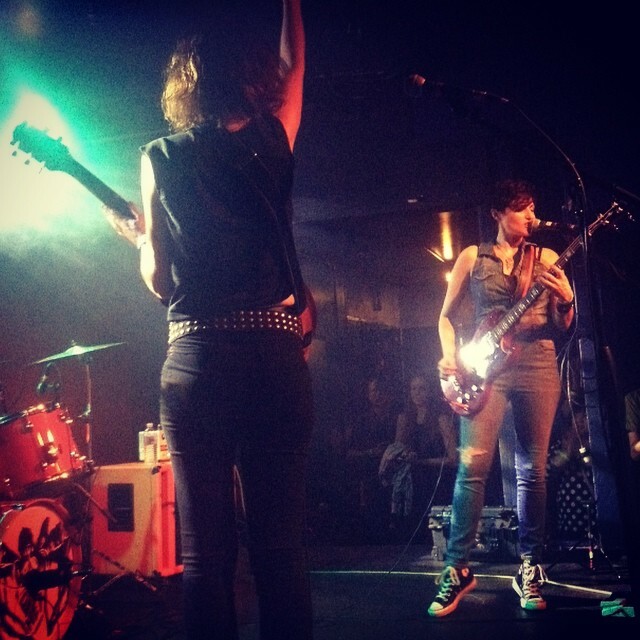 In case you didn't know: Ex Hex's debut album Rips came out last week, and it's out of this world. When you listen to Rips in the car, ideally when the sun's just going down, it makes any night sound like it's a Friday and you're 17 and about to have a quintessentially exciting Friday-night-when-you're-17 sort of experience. Like it's summertime and you just finished your shift at a job that involves standing in very close proximity to frying food for hours on end, and the grease somehow altered the texture of your hair in an interesting yet disgusting way, and you go home and wash your hair with a shampoo that's scented with strawberry or coconuts and get all ready to go, and then your best friends come pick you up and you're off. Every second of Rips has all the hot happy energy of that anticipation: it sounds like the radio playing when you’re driving home from your hair-ruining job, the radio playing in the shower when you’re washing your hair, the radio playing when you’re getting your jeans and your lipstick on, the radio playing when you and your bros are on your way to the party or the woods or the show or whatever. It’s all those beautiful radios, all at the same time. When I talked to Mary Timony for the interview, I told her how I wanted someone to remake the movie Foxes and have Ex Hex do the soundtrack. But then I rewatched Footloose, and it's even better and deeper than I remembered. So now I think the ideal would be to erase that remake from a few years ago, and do a new Footloose where Ren McCormack is a girl and the music is all Ex Hex. Everything else can stay the same: the preacher's daughter in the red cowboy boots, the short-sleeved sweatshirts, the mountainous backdrops, teenage Sarah Jessica Parker and her cute scratchy voice, how Ren's so righteous and moral about being a rock-and-roll rebel, how they're always going out for french fries and Cokes, and basically every single line of dialogue in the entire film. Like, the part when Kevin Bacon's telling Chris Penn about the underground place where he used to go dancing back in Chicago and says something about "Hot-pink neon climbing up the walls, and astral music"? That's so completely true to the Ex Hex spirit. Anyway - right now my top Ex Hex song is the third-to-last track on Rips, which is called "War Paint." There's a good chance it'll remain my favorite Rips song forever, since it's got a serious melancholy/triumphant dynamic going on and that's generally my number-one vibe. Mary's always been one of my favorite songwriters because of all the world-building in her lyrics, how it's both finespun and sprawling, and the cruising-strip-in-1982 thing she's doing on Rips isn't any less magic or romantic than her songs that happen in faraway places. It's like time-travel, where you're going back in time and into some cool future in the same moment. I didn't even know that kind of time-travel existed. I was also at this show & agree with your assessment completely! <3 War Paint, but also How You Got That Girl. I'm in love with this album. It's the all-girl Seconds of Pleasure of our time, which is basically the power pop record I've always dreamed of being able to sing along with.